Pure i20 review | What Hi-Fi? If you've got an iPod, one you occasionally connect to your hi-fi system via its headphone socket, you'll know the sound can't always be described as ‘impressive'. The on-board digital-to-analogue processing is to blame, which is why a dock with a DAC is such an appealing idea. We've heard them before, of course, but never one as aggressively priced as this Pure i20. 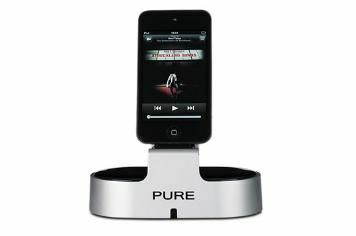 Your £75 buys a compact, sturdy dock that can accommodate iPhones and more recent iPods. It's got a lot of outputs (optical, coaxial, stereo RCA, composite and component video) at the back and comes with a tiny, creaky remote control. Inside, Pure has somehow made room for a 24-bit 192kHz DAC. Sound via the analogue outputs is an obvious improvement on an iPod's own analogue signal, with greater breadth, weight and detail all in evidence. It's an improvement dynamically too, with altogether more authority over recordings. It sounds better yet delivering digital information to an off-board DAC, mind you, and that's still the route we'd suggest – but if a quick, inexpensive fix of your iPod sound is what you're after, don't look any further.